Despite living in a country that is renowned for its wet weather, the UK nearly always ironically experiences a hosepipe ban or water shortage warnings during the summer months. With water shortages it is most often the keen gardeners who are affected and are urged to reduce their water usage in order to conserve stocks in the local area. In such instances, what can the keen gardener do that will save water but also keep the garden looking nice and prevent plants from wilting away? Lawns will go brown relatively quickly if they are not watered regularly. However, once they do receive some water they will quickly return to a lush shade of green. Garden landscapers and turfing experts will advise you to conserve water by leaving the lawn in times of extreme water shortages. It can always recover, whereas other plants may not. What is more important, keeping a pretty selection of flowers alive or maintaining the fruit and vegetables you have been growing for months and rely on to make salads and cooking that bit more enjoyable? Ornamental plants could be sacrificed in favour of fruit and vegetable plants and crops. You could invest in the services of a professional garden landscaper to plan your garden for you to specifically suit a dry summer. Weeds are undesirable for a variety of reasons. Not only do they look bad, they can cause damage to your plants, especially when trying to conserve water. Weeds steal vital moisture from other plants, so it is best to get rid of as many of them as you can before watering in times of water shortages. 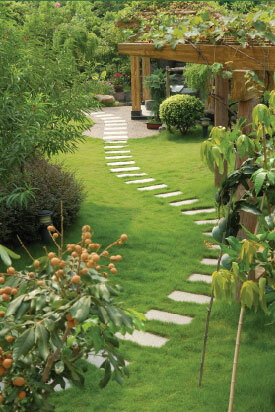 A professional landscape gardener will know the best methods to maintain a garden during a water shortage. By asking for professional help, your garden could easily survive a long, dry and hot summer.